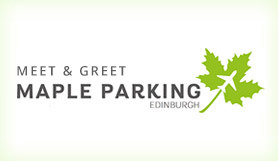 Book Edinburgh Maple Parking Meet and Greet service, the only offsite Meet and Greet service at Edinburgh airport. (Previously known as ACE Parking.) This product allows you drop your car off with a uniformed chauffeur outside the terminal, leaving you just a short walk inside. You can then board your flight knowing your car is parked in a secured car park away from the terminal. When you arrive back to Edinburgh airport, your car will be waiting where you left it with your chauffeur ready to hand back your keys. This is a great way to park at Edinburgh airport. Disabled facilities: This parking service is perfect for disabled customers as there is no need to get a transfer bus, contact is required with the airport to discuss disabled facilities / assistance from the meeting point. Please take a copy of your confirmation email with you on your day of travel. Please call Maple Parking when you are 15 minutes away from the terminal so that we can dispatch a driver to meet you. Please have your booking confirmation and reference number to hand when you call so that we can check all of your details with you. Then please follow directions below to the meeting point at the Airport terminal. •Exit the A8 following signs for Edinburgh Airport. •As you enter the Airport go straight across the roundabouts following signs for Terminal and Pick Up Zones R-S.
•As you go through the barrier take a ticket and follow signs to Pick Up Zone. •Once in the Pick Up Zone go to the right corner where your driver will meet you. As soon as you have collected all of your luggage, please call us using the telephone number on your confirmation email to let us know and your car will be delivered back to the Pick Up Zone where you dropped it off. Directions to this point will be given to you by your driver when you drop off your car. Follow signs to Edinburgh airport.